Under the guidance of Megan you will learn the important skills of home food preservation in a social setting, mastering the basic technique of pressure canning. There will be time for you to have one-on-one assistance, with a combination of hands-on cooking and demonstrations during the class. Whilst jars are processed, you can relax with a cuppa and enjoy some morning tea whilst we make a batch of jam. Then a quick class photo before you head home with a jar of soup (and jam), and the handout with pressure canning information and the class recipes. 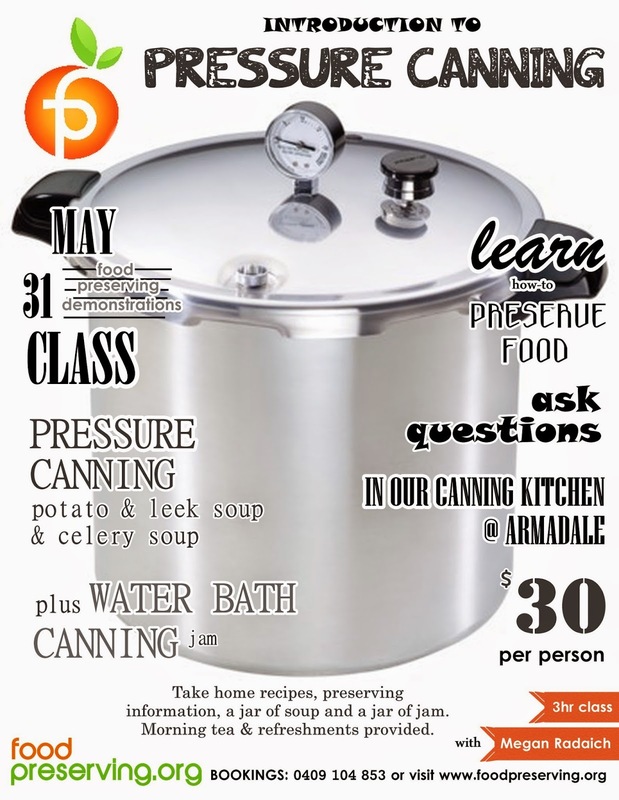 Pressure canning classes usually run for around 3 hours, but occasionally run overtime, please notify us if you need to leave at a certain time at the beginning of the class. All equipment, jars and ingredients are provided – but make sure you wear suitable clothing, enclosed shoes, hair tied/pinned back and an apron. If you have any food allergies, please notify us prior. Pressure canning classes are held in our canning kitchen in Armadale - a great opportunity to see where we make our preserving recipes, and see our jar room!